The AIAS serves an important role as the sole student voice amongst the five architectural collaterals and we have an obligation to inform our members of the importance of licensure and how that relates to their education. Given this imperative need, President Rosen is embarking on the 6-in-6 Campaign over the course of the next 6 weeks, within which she will be studying and taking all 6 ARE® 5.0 Examinations. Throughout the campaign, Rosen intends to demystify the process for licensure by dispelling existing stigmas regarding the ARE® process, while showcasing the value of taking the Exams, the various requirements of different state licensing boards, and the pros and cons of available ARE® study materials and study groups. 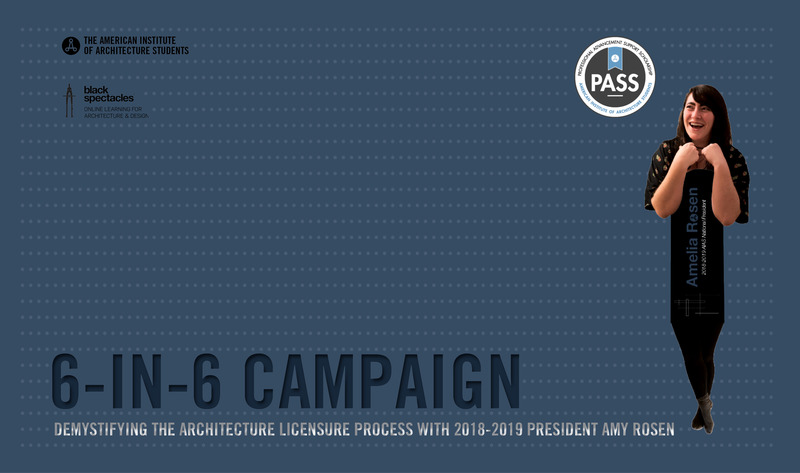 In addition to highlighting replicable resources and strategies that AIAS members can utilize when taking their licensing exams, this campaign is also geared towards raising awareness of the existing PASS scholarship and raising additional funds for future PASS scholarships. PASS is geared towards encouraging young professionals to make a plan to move toward professional licensure and begin on that path as soon as possible. The Scholarship is available to alumni of the AIAS who aim to pass a division of the ARE® within one year of graduating, covering the full cost of that Exam – which is $235! If you would like to support future architects, donate to the PASS now! The structure of the Campaign will be as follows: 6 weeks will be dedicated to the campaign in total – with Week 1 beginning on January 20th and Week 6 ending on March 2nd. Since most alumni members are only able to study for their ARE® Examinations in the evenings after full days of work, Rosen’s studying will take place every evening from around 5:00pm to 11:00pm, allowing for 6 hours of studying each day. This strategy of time allotment is geared to allow the results of the testing process, and the campaign as a whole, to be much more valuable and accessible to members. The campaign is structured into a Week-by-Week system, such that students and alumni are able to garner useful tips and tricks for each Exam separately and scale them to whatever study time period is appropriate for each individual. 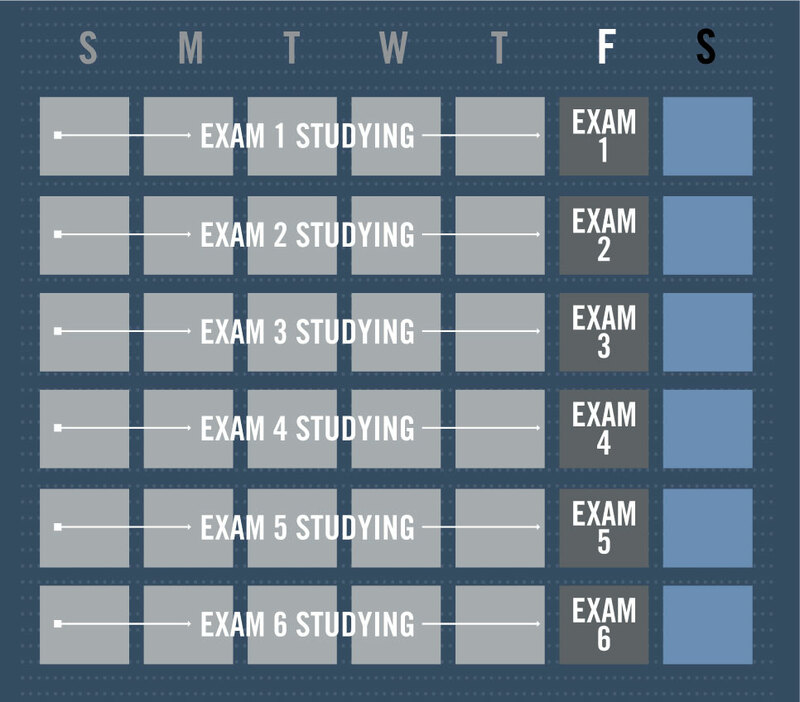 In addition to providing insight into each Exam division independently, the Week-by-Week system also intends to provide insight into optimal study/cramming strategies for one’s last week of preparation prior to an ARE® Exam. The schedule for the campaign, including all dates associated with each Exam division can be seen below. It is important to remember that each individual pursuing licensure is different; thus, each individual person’s study strategies should be uniquely fitted to their personal capacities. However, this campaign will provide AIAS members with the opportunity to learn from President Rosen’s experiences and be more confident when structuring and navigating their individual path to licensure. Throughout the six-week campaign, President Rosen will be utilizing the @aiasorg Instagram story to share periodic updates and study tips and tricks. These updates will occur on Mondays, Wednesdays, and Fridays. There will also be many live questionnaire and interactive opportunities to engage with President Rosen live while she is studying, so be sure to tune in!